Ever wondered if beater cars are worth the money? Perhaps you're looking for a used car buying checklist so that you can be more confident when buying a used vehicle? You’re in the right place! This post may contain affiliate links – it's how we keep the lights on around here. Here's our policy. They’re so darn cheap that you can pay cash for them (goodbye car payments!). The depreciation has already occurred (ever hear that a new car loses value as soon as you drive it off the lot? Well, someone else has already taken that hit to the chin back in the early 2000s when the beater car was brand-spankin’ new). Insurance premiums are lower (yes!). Sure, it’s not all smooth tires and passed state inspections when you own a beater car. But as an overall personal finance strategy to keep way more of your paycheck in your bank account? Well, going from beater car to beater car is just the trick. Think about this: I’ve never had a car payment in my entire life. Not one time. I’ve paid cash for each of my 4 beater cars I’ve owned since I was 17 (and just a few thousand dollars at this). And since I wasn’t draining my checking account of $350-$650/month for a car payment? I was then able to save money each month towards the next beater cash purchase. 18 years later, and I’ve learned an awful lot about owning beater cars, buying beater cars, repairing beater cars, and living with beater cars. So, click around and stay awhile while I let you in on this world. What Does Beater Car Mean? How Many Miles Do Cars Last? At What Point is it Not Worth Getting a Beater Car? Are Beater Cars Worth it? First off, ever wonder what does beater car mean? I didn’t know actually know what people mean by beater car for a while either, even though I’ve been driving one around since I was 17. Now that I’ve been driving one for 18 years (don’t do the math to figure out how old I am…), I’ll give you my definition. Beater car definition: an old or high-mileage – or both old and high-mileage – car that is still fully functional and legal to drive on the road, and that is so darn cheap to purchase, you can pay for it in cash. These are cars that still pass state inspection and registration requirements, but that you know won’t be coming with you into the next decade. And while this car will get you from Point A to Point B on a semi-reliable basis (more on how to make them as reliable as possible, later), you’re not going to be winning any car pageant awards anytime soon. In fact, don’t be surprised if people assume you are much less well-off than you actually are – in part due to not having a car payment like they do – because of the look of your beater car. Goal: I plan on driving it until its totaled or quits running. Goal: None; it stopped working six months ago, and he has been riding his bike to work ever since! Goal: When I can get lots of electric car parts at pick and pull I may consider a different car type. Why invest a lot in an obsolete technology? Who killed the electric car? etc. The quick and dirty answer to how many miles do cars last is really as many miles as you’ll let it. That’s because a car can be repaired multiple times, and in multiple ways, to keep it on the road. But to be honest? If you own a beater car, then at some point you’ll have to decide when a car repair is no longer worth it and your money would be better spent on a new beater car. For example, when my 228,282-mile beater car that I had paid $1,500 cash for 6 years earlier blew its head gasket, and the price tag to fix it was $1,500, I knew it was time to move on. But when my 175,000-mile beater car that I had paid $3,500 cash for 2 years earlier needed a new bearing because it had literally worn out from the miles, that was a clear “yes”. Subsequently, I had several more years with that one. While I’ve personally taken two cars over the 200,000-mile mark, I can also share with you that experts also think getting a car to over 200,000 is a-okay. Each year, Consumer Reports gathers data from 640,000 vehicles to compiles lists of the most reliable cars, plus other important reports. According to Consumer Reports, the average age of all cars on the road is more than 11 years. Even better than this? Making it over the 200,000-mile mark with your cars – which they say is doable (though not always smart, if you’re plowing lots of money into the car) – can save you an estimated $30,000 in your lifetime! That’s no small chunk of change. Now let's look into should you buy new or used cars. As my father used to tell me, a car is made for one reason and one reason only: to get you from Point A to Point B. They are not an investment, as they lose a substantial amount of value (starting from when you drive them off of the lot, where 20-30% of their value suddenly disappears with that new car smell). So why, then, doesn’t everyone buy a beater car? The thing is, there are reasons that it’s not worth getting a beater car. Of course, it mainly comes down to priorities, values, and your personal situation in life. But I’d like to point out some cases where it might not make sense to get a beater car for you and/or your family. You Want/Need a Good-Looking Car: While beater cars can run the gamut of rust-bucket all the way to “hey, that’s not too bad”, you won’t likely find a car within the price range of a Beater Car that looks like it rolled off a car dealership lot. I once had a sales rep tell me that they would sell less items if their car didn’t look like it was pricey (i.e. that the salesman driving it was a successful person who could afford a flashy car). Whether this was an excuse for why they needed a new car, or actual fact, is up to a person in that type of profession to decide. You Need 100% Reliability: Nothing is ever 100% reliable, but a beater car could be 50 miles away from a transmission failure, A/C fiasco, or just quitting altogether. And with a new car? You should have some peace of mind that it will not break down on you. 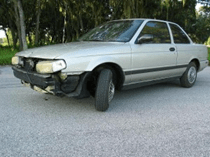 I’ve got ways below to make your beater car more reliable (see the section on “how to fix common issues with beater cars”), but if you’re looking for as close to 100% as possible, then you might want to look at a mid-priced car. You Want to Be a One-Car Family: I'm thinking if you only have one car, then you should probably get a more moderately-priced used car for higher quality and reliability. Read all about our last year as a one-car family here. Having Everything Working in Your Car is of Premium Importance to You: Most beater car owners will merrily (or not-so-merrily) list off at least 2-5 things in their car that are no longer functional. They’re not necessary to the car being legal or driving, but they can become a nuisance overtime. For example, in my own experience of owning 4 beater cars over the last 18 years, I’ve had a handle-less gear stick (you could still shift it), rubber-worn-off steering wheel, leaking power steering fluid, upholstery tears, etc. You Can’t Find a Car Mechanic You Trust: If you own a beater, then you’ll need to also have a trusted car mechanic. 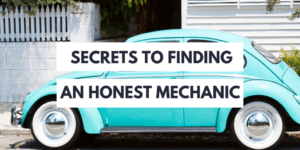 I’ve detailed here how to find an honest mechanic you can trust. Once you establish that relationship, they can save you all kinds of money (as ours has in the past!). But if you don’t want to go through the process, or can’t find someone you personally trust, then your vehicle could quickly turn into a pit of wasted money. Instead, a good car mechanic can point out defects/repairs that don’t need to be made, versus ones that have to be made. They can also work with you on workarounds to issues, such as when my mechanic took a repair cost down from $700 to $95 when he rerouted a line so that a leak stopped (though it left me with no heat – something he told me would happen, and I decided to say “yes” because I live in Houston). I got several more years out of that vehicle! 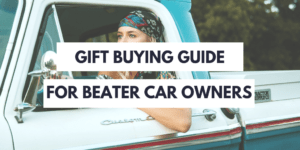 You don’t want to just find any old beater car – unless you’re in dire financial straits and getting to work is an issue (pssst: if this is the case, look at my section on my beater car money strategy to give you ideas on how to not get in this position again). No, you want to find the best beater cars to buy. How many miles on a car is bad? : We’ve discussed previously not only my own experience with taking two vehicles over the 200,000-mile mark, but also how Consumer Reports looked at over 647,000 vehicles and decided that it is totally okay + doable to take your car over the 200,000-mile mark. But to be honest, it’s not always the wisest decision. In other words – it’s not meant for every car out there. Some cars are better left at 160,000 miles, while others can get to 250,000+. So instead of wondering how many miles on a car is bad, you should look into each car’s personal history of repairs and maintenance. You can also look up that particular car’s make/model and see how reliable it is. You could even talk to owners of the car (or just google it and read through comments in forums you’ll find) to see how happy they are, and how many miles are on their car. That all will give you a way better handle on figuring out how many miles a car can handle. Has the Mileage Maintenance Markers Been Taken Cared of? : You know how in a car owner’s manual, there are certain mileage maintenance recommendations – and by a few, I mean, like a dozen? Many owners get to the point where their car mechanic tells them it’s time to do a whole bunch of these things, and instead of taking care of it, they bail. What this means for you is, you don’t want to buy a new beater car, and then immediately be on the hook for all those maintenance things. Instead, you want to buy a beater car that was properly maintained prior to your ownership of it. Here’s a maintenance schedule example list of some of what I’m talking about – a car owner will likely bail at around 90,000-miles, and sometimes at the 60,000-mark because they’d rather get something new than pay hundreds and maybe even thousands to maintain the car. Check Out the Kelley Blue Book Value: Do a quick search on Kelley Blue Book to see how the value stacks up to the asking price. If it’s significantly lower…you might want to root around to see what’s wrong with the car. It could be luck, but it could also be something much worse. Find Out Which Cars Last the Longest: There are resources from places like Consumer Reports’ Best Reliable Used Cars List and Kelley’s Best Used Cars Under $8,000 list that share the most reliable cars on the market (of course, you don’t want to know the most reliable cars of this decade, necessarily, when looking for beater cars – so these lists are only so helpful). You can also check out Consumer Report’s Local Used Marketplace by putting in your zip code and the make/model of the car you’re wanting – they’ll list out the reliability score for it. Buy with Your End Goal in Mind: Some people only want a beater car that they can drive around in the winter (to keep their other car looking nice – salt on the road and other issues can really wreck a car’s paint job!). If this describes you, then you’re looking for best beater cars for winter. And since you’ll only be driving the beater car for part of the year, you’ll care more about the car’s ability to drive in snow and ice than its ability to rack on the miles without dying. Here is Car Throttle’s list of the 10 best beater cars for winter. Popular Mechanics has a similar list. Driving beater cars for 18 years means that I’ve got quite a few beater car stories under my belt. Pssst: beater cars are great for new drivers. But boy do I wish I had had these new teenage driver gifts when I was just starting out driving 18 years ago! I’ll even share a few of them with you here! Like that time I was backed into by a cement truck, and made out on the deal with $500. What happened is I pulled up to a stop sign behind a cement truck, and when they took their foot off the brake, they backed right into me. My beater car lost it’s Chevy logo, and had a minor dent in the hood. The estimated repair by a local repair shop was $500…so instead of the company having me submit a claim, they asked if I’d just take the money. I said “sure!” Because anyone with a beater car knows they don’t own it for the looks. That $500 went straight to my savings, and the dent remained for another 5 years, when I sold that car for $400 and bought my next beater car. I used to be an Amish taxi driver. For a summer in-between college (and a few semesters during college), I would drive Amish to their markets to sell goods, or drive them to the doctor’s, or drive them to go “visiting”, or really any other place they wanted to go. I would charge $0.55/mile, and $10/hour of waiting time. I made some awesome cash this way. In fact, my father does this for a full-time living! And one of the things I loved about this? Was that I used my beater car – the one I had paid $1,500 for – to earn the money. How’s that for driving a beater car to work? On my very first beater car that I had bought, I installed an alpine stereo. It was awesome! Unfortunately, three years into ownership the car started overheating really badly. We were able to get it to a car shop by putting water into it. And they found that the head gasket had blown, which would be a $1500 repair. Since I had only spent $1,200 on the car itself, II decided it was not worth it. The car repair person said I could keep it at their lot until I figured out what to do with it. But what I didn’t foresee happening (neither did they) was someone breaking into my car, driving it 1.5 miles up the road (presumably until it died on the) and stealing the alpine stereo out of it! *sigh*. That one stung. Beater cars are really used cars…but even a few years older and thousands of more miles than what someone would normally considered “used”. So, whether you’re buying a used car or a beater car, you’ll want to use the same checklist I’m about to give you. 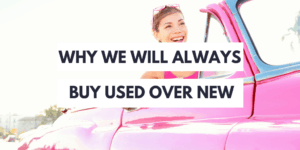 Choosing carefully – which you will be, when you check into all these things – gives you a much better chance of saving lots of money and keeping your beater car for 5+ years (if a beater car gives you 5+ years without a car payment? Well, then I consider that a winner). Vin Number: With the VIN (Vehicle Identification Number), you can look up lots of things, including any safety recall issues. This number is likely 17 characters long, and you’ll want to get it before you decide whether or not to purchase a car. Mileage: How many miles does the car have? Check this against the auto history report below, or using CarFax’s free Odometer check (you’ll need the VIN). Car Value: Look up the car’s value from a third-party source, like Kelley Blue Book. Values are given in ranges of condition (fair, good, very good, excellent). Knowing this information, what does the cost of the care tell you about it’s condition, based on Kelley’s rating system? You can also do a quick search here for free with your VIN. Checked by Third-Party Mechanic: The person/dealer who is selling you the car will probably tell you it’s in good working condition, as verified by their mechanic. But you should really ask to take the car to your own mechanic for a check. This inspection typically costs about $100. Passed State Inspection: Make sure the car has passed its state inspection and registration. You don’t want to run into problems right off the bat! If the seller hasn’t bothered to do this, ask that this be done as a condition of sale. Take it for a Test Drive: How does the car feel? Does it make any funky noises? Do a functional once-over, such as making sure all the lights work, the signals, the windshield wiper blades, and that the wiper fluid works on both sides of the window (ours only squirts out on the driver side, and we didn’t think to test this on a sunny day), etc. Does it Have a Spare Key? : This will save you potentially big bucks. Getting a new key made from a normal key is cheap. But if your key is a newer type with lock/unlock features, then the cost is typically $100-$300 (yet another lesson learned the hard way. *sigh*). So, you’re looking at a beater car, or just bought one, and there are a few issues with it. You’re probably wondering if it’s worth it to buy the car, or even to fix the issues, given that it will likely only last a handful of years. While not every repair is going to be worth it on your beater car (check out my personal beater car stories section to figure out a few that weren’t worth it in my eyes! ), it IS worth it to you to make some adjustments in order to be as comfortable as possible commuting and driving your beater car around. There are relatively cheap fixes to the common problems that riddle Beater Cars: you can give them a paint job, purchase a new CD player, and get Freon added in to boost the A/C system. Safety Kit: Okay – we both know that beater cars are going to be less reliable than a regular car. Even though I've had mega success with my own, I have always kept a road safety kit in the trunk in the event that I get stranded. I would advise you to do the same! No Heat: No heat? I went several winters without heat (there was a leak in the heating core, but they reroute it to fix it for just $95). I also lived in Houston, so it was doable. Still, you can buy a seat heater for your car, which will make your trip much toastier even without regular heat. Sucky Radio: You can purchase a brand-new car stereo if your own car’s system doesn’t work. I’ve personally purchased two Alpine car stereo systems and had them installed. Just remember, installing these can also cost a few hundred dollars, depending on the difficulty level. Torn/Missing Floor Mats: I find that floor mats are usually missing, falling apart, and otherwise in terrible condition. Good news for you is that replacing floor mats is an easy + affordable to give your beater car an upgrade in the looks department. You’ll, of course, need to make sure you find ones that fit – which is why these customizable floor mats ones are a good idea. Worn Out Steering Wheel: I’ve owned several beater cars where the rubber on the steering wheel has been completely worn off. That’s a simple fix! Just get a universal steering wheel cover, like this one. Funky Smell: Fortunately, none of the cars I purchased had an off-putting smell. But it could happen to you! Here’s an ionic air purifier for your car (and much cheaper than I would have thought!). I want to give you my beater car money strategy. This is, after all, a personal finance blog! Here’s the deal: a beater car money strategy is your ticket to getting off the car payment treadmill for life. But only if you do it right. Another lesson I learned the hard way, but that has served me well ever since! 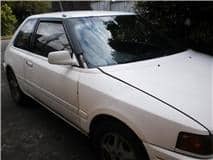 While you are enjoying a year, 3 years, or 5+ years without a car payment, make sure you sock away some money to a car fund each month so that when this beater car dies, you will have money to purchase a new one. Here’s what you want to do: Buy your first beater car in cash. Only buy one that you can afford – so you might start out with a $2,500-$3,000 car. And that’s fine. Then, every month that you don’t have a car payment, still send a car payment into your car fund savings account. You could send in $350-$500/month. By the time your current beater car breaks down (to the point where it doesn’t make sense to fix), you’ve got enough money to trade up to a new beater car. Hopefully, a nicer one than the first one you bought! Pssst: take a peek at the section on Who Buys Used Cars, as you should still be able to make a little money when selling your broken-down beater car at the end. That way, you can take that money and add it into your next one! But that’s not my only beater car money strategy. Find an Excellent, Honest Mechanic: The next repair you have to take care, instead of googling “mechanic near me” and hoping for the best, take it as an opportunity to vet several mechanics and find an honest one. This one move will save you hundreds, if not thousands of dollars over the coming years (not to mention give you a boost in confidence for riding only beater cars). Take the urgency out of your decision-making: By either borrowing someone’s car, carpooling with your partner, or paying someone via Uber/Lyft. You need to buy yourself time to make a good decision. 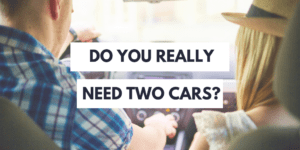 Trust me – I’ve personally experienced one beater car purchase when we felt under the gun, and it was the worst decision that ended up with us in the same position of having to beater car shop just two years later. Consider Whether Comprehensive Insurance is Really Worth it: Typically, we don’t keep comprehensive auto insurance on our beater car. That’s because it doesn’t generally make sense, financially. You pay an extra $60-$100/month to do so, on a car you only paid a few thousand dollars for? Nah. Instead, insure yourself. This means, put that money you’d be paying into an insurance policy into your emergency fund instead. Then if something goes wrong, you can make the repair (without also having to pay a $500-$1000 deductible first). So, your beater car dies…now what? There are several options you have to squeeze out some more money (which could help you recoup some of the original amount that you actually spent on it, not to mention help you buy the next one!). 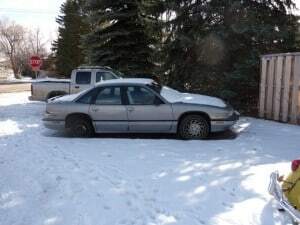 Sell it to someone who fixes up cars: I did this for a sweet $400 for my 1997 Chevy Cavalier, and $200 for my 2003 Chevy Cavalier. Donate it: There are lots of places where you can donate a vehicle, and many will actually pick it up for you (hint: they’ll pick it up from any location, so don’t bother having it towed back to your house) and give you a tax deduction. Of course, with this strategy, you’ll only get a tax deduction if you can itemize on your taxes. We donated our 1999 Nissan Frontier to Purple Heart, who picked it up from the car lot where it died, and gave us a $1200 tax deduction for it. Hurrah! Scrap it for metal: Yes, you can scrap a car for metal. If all else fails, this will reap you several hundred dollars. Now THAT was a beater cars guide! I hope you've learned a lot from all of my experience over the last 18 years. Please share with others if you found value.